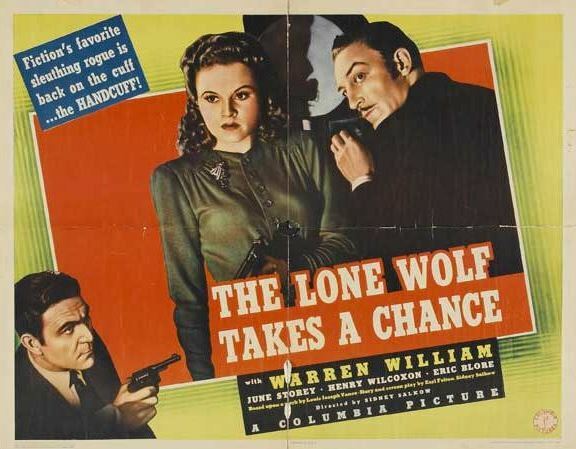 Yet another case of sleeplessness (maybe I should mention this to my doctor), led me to discover The Lone Wolf Takes A Chance (1941) in the wee, small hours of the morning. 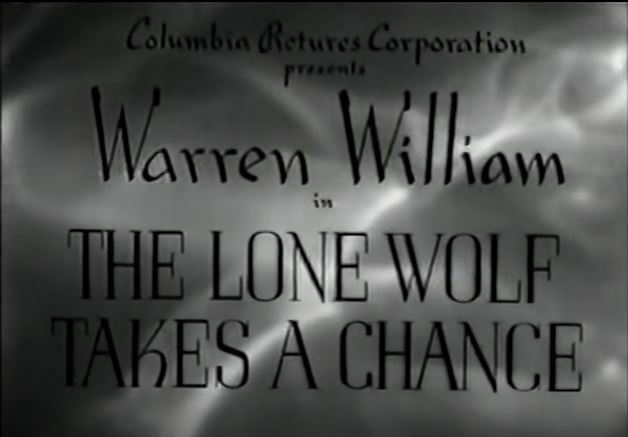 This film is the 5th in a series of nine “Lone Wolf” movies that starred Warren William as retired jewel thief Michael Lanyard. Now reformed, Lanyard devotes himself to helping private citizens solve crimes. The police still don’t quite trust him. 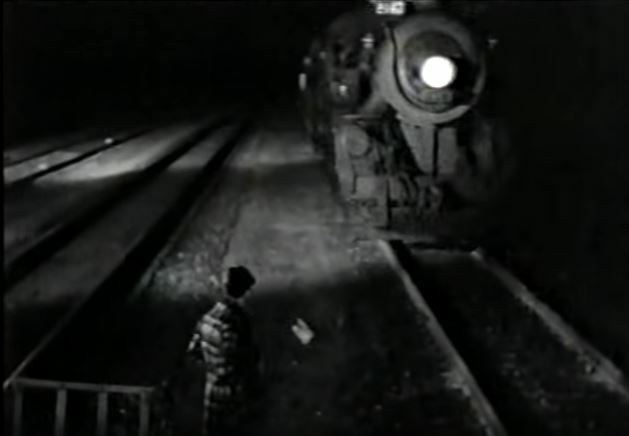 Most of the train scenes happen at night (it’s kind of hard to see or get decent screen captures), so apologies for that. 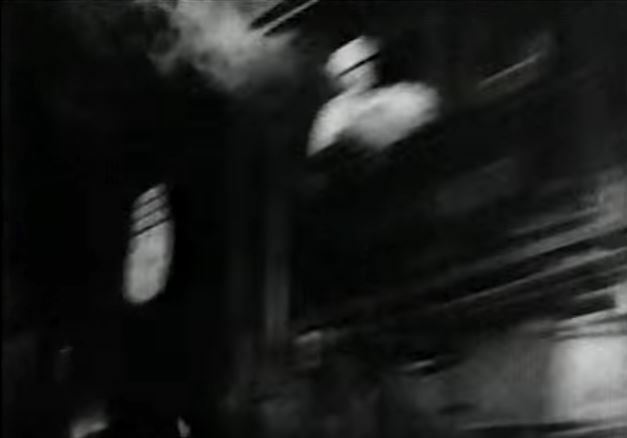 Despite the murkiness, there is quite a bit of train action featuring two Southern Pacific steam locomotives #2445 and #2447, both Class P-5 4-6-2 Pacifics built by Baldwin Locomotive Works of Philadelphia, Pennsylvania in 1912. The movie itself is very entertaining. What say we check it out? 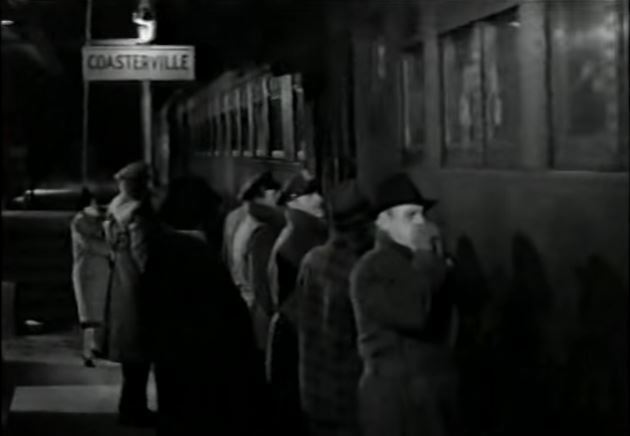 SP 2447 enters “Coasterville” (hastily renamed SP station) where the cops are waiting to arrest our hero, Lanyard. 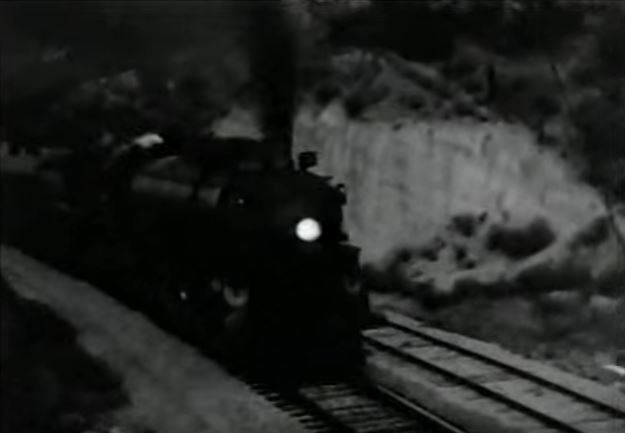 Trains first appear about 18 minutes into the movie. 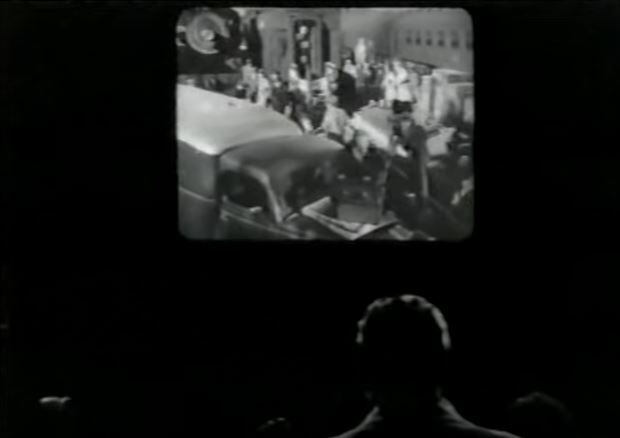 Lanyard is in a movie house when the newsreel comes on. 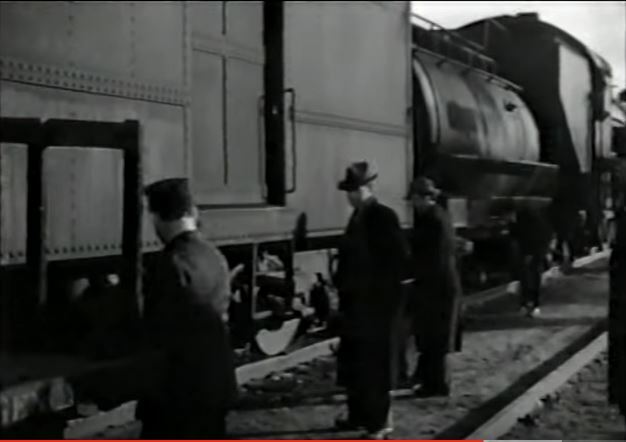 The gubmint has developed a burgler-proof baggage car to transport plates for making money. Only the inventor knows the combination. 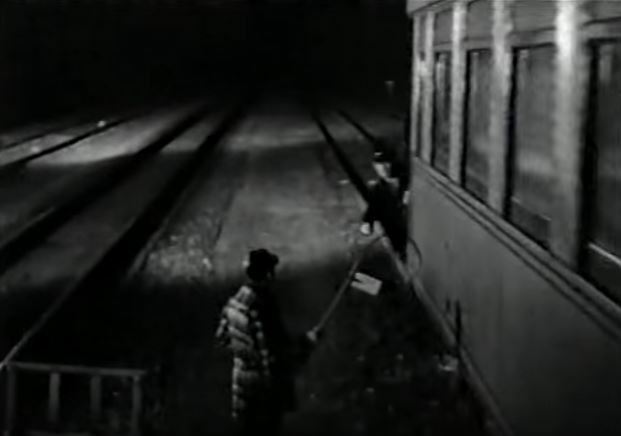 Sitting “Mystery Science Theater 3000-style“, Lanyard watches what’s happening at the SP coach yard; Holy Steve McCroskey! 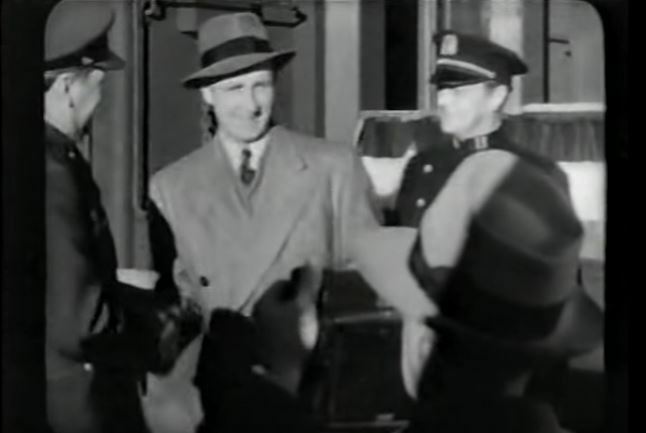 It’s Lloyd Bridges as inventor Johnny Baker in his first credited film role. A couple gratuitous shots of SP steam power rolling along. The bad guys have kidnapped inventor Johnny (Combo Boy, of course!) 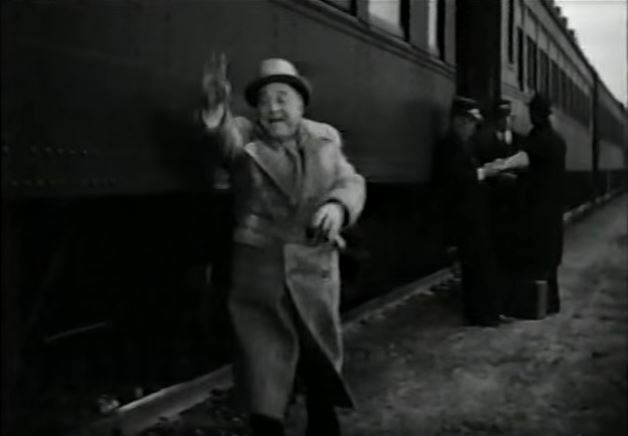 and brought him onboard the New York to Chicago train with the special baggage car up front. 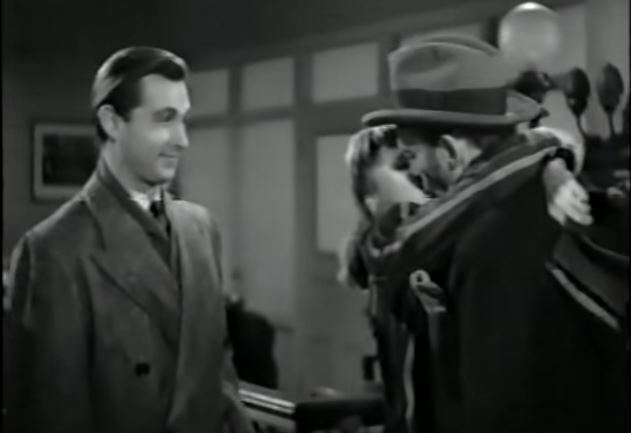 Johnny is engaged to “Hollywood’s First Lady of the Cinema” Gloria Foster (played by June Storey). Lanyard and Foster team up to rescue Johnny and foil the crooks. 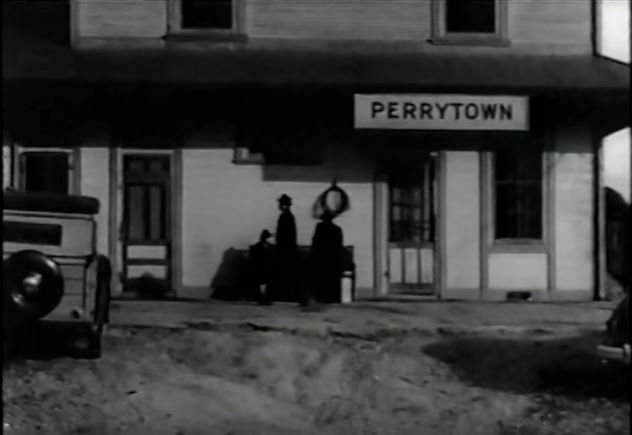 Lanyard and Foster board the train at “Perrytown” (an SP two-story depot). Nice shot of the tender of SP 2447 with all Espee markings carefully painted out; Comic relief in this picture is provided by Lanyard’s sidekick, Jamison (played by Eric Blore). 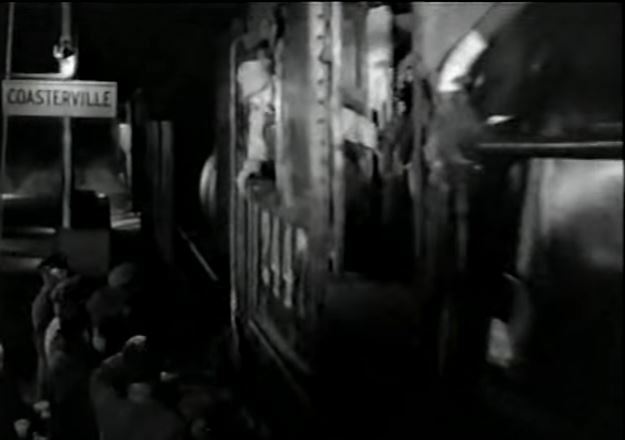 Action shots of telegram being “hooped up” to the conductor on the last car. Telegram! A-ha, the cops are onto Lanyard! 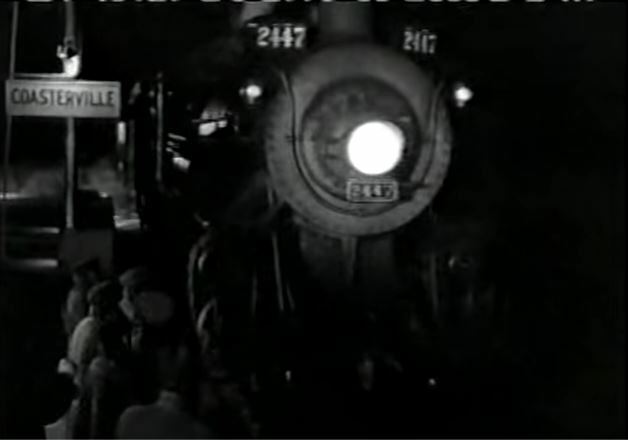 ; The engineer of SP 2447 leans way out of the cab for his portrait at Coasterville. 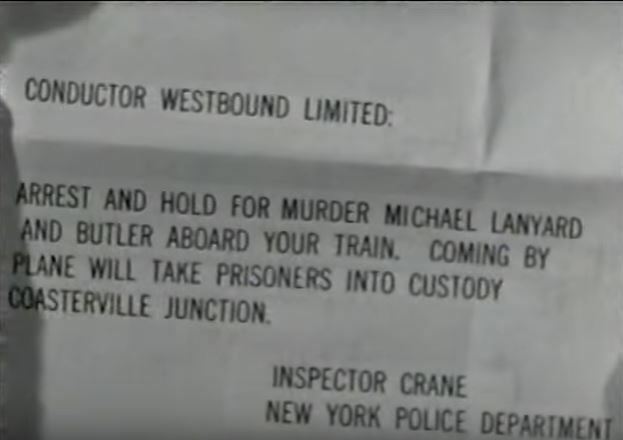 The police are waiting at Coasterville to arrest Lanyard & Jamison. 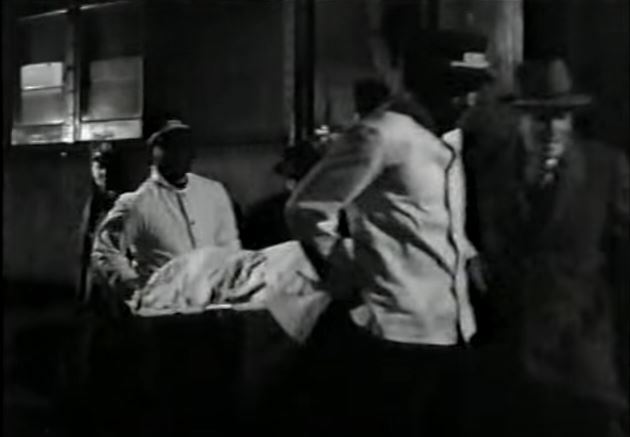 Naturally, they all get off the train undetected along with inventor Johnny (the crooks use the old stretcher ploy). 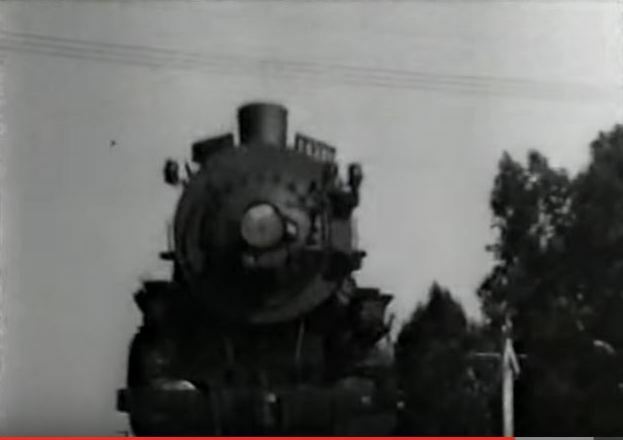 Runby of a UNION PACIFIC steam engine and passenger train (note the UP Overland Route shield on the tender). Maybe they won’t notice…. 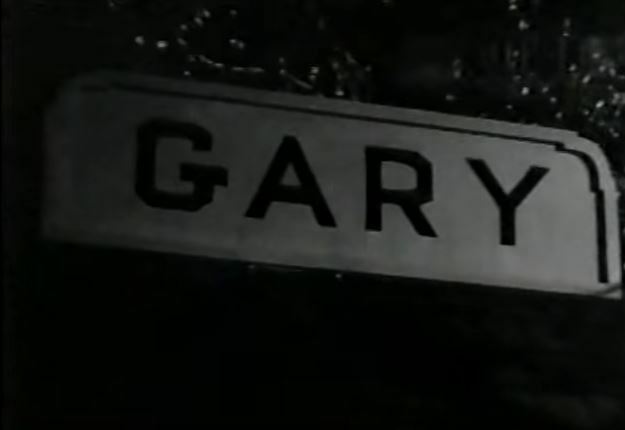 Poor Lloyd Bridges is all trussed up; Pulling into Gary, Indiana and….AND…. Still more confusing plot left off here. Free at last, Johnny and Gloria thank Lanyard for his services. Again, sorry for all the sucky screen captures. The movie itself IS pretty good. One of those suspend-disbelief-and-just-enjoy type of flicks. 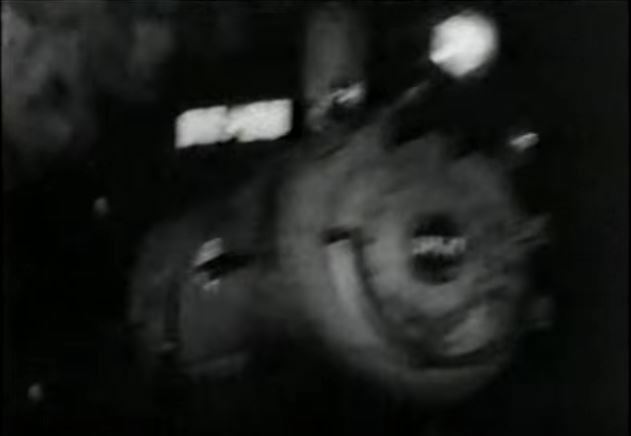 For a B-movie done on a shoestring, Columbia Pictures at least made it interesting – with my favorite mode of transportation providing some heft. 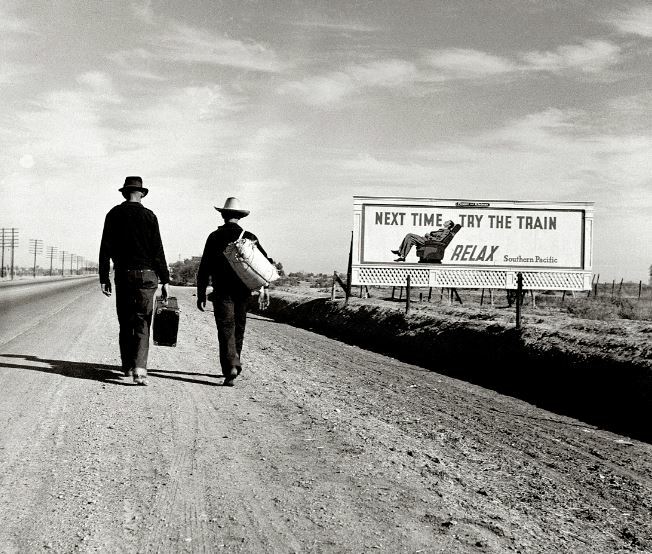 Next time, take the train! 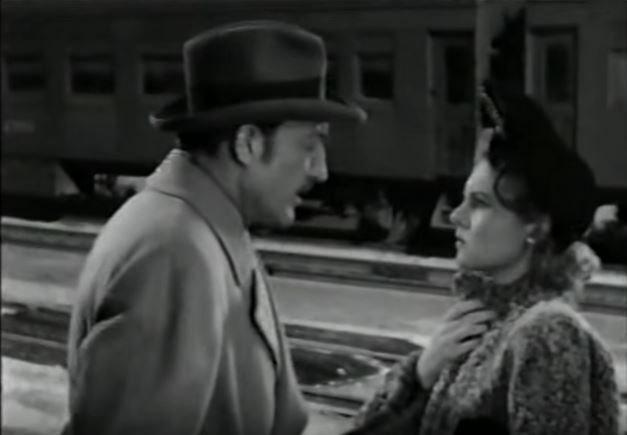 This entry was posted in Uncategorized and tagged Columbia Pictures, June Storey, Lloyd Bridges, Next Time try the Train, Southern Pacific Railroad, Steam Locomotive, The Lone Wolf Takes A Chance, Union Pacific Railroad, Warren William. Bookmark the permalink.